Why do we put the word, visual, in High-Speed Visual Imaging? Many people think that high-speed phenomena must be photographed to be seen. In fact, such fleeting events as balloon bursts, rebounding tennis balls, and liquid splashes can be seen with the human eye under the illumination of a brief burst of light. While we can't show you live demonstrations here, we do provide video clips that show you what you would see and hear. We also provide descriptions of how to perform some demonstrations (see Teachers), and how to produce your own video of high-speed phenomena (see Video). The splash of a drop of liquid is perhaps the most recognizable and prevalent of all high-speed images. A. M. Worthington first photographed splashes more than a hundred years ago. His book on the subject, A Study of Splashes, is a classic, although it's not well known to the general public. 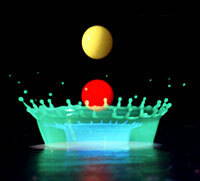 The person who made the image of the splash coronet familiar to the general public was Harold Edgerton, former MIT professor and father of high-speed photography in the 20th century. He spent years trying to photograph the perfect splash. We added our own twist to the photography of splashes and chose the image shown above for the HiViz.com logo. The use of colored filters on 4 flash units provided visual separation of overlapping images. For more information on how this photograph was taken, click here. We provide our materials for non-commercial use especially by students, teachers, and hobbyists. We require that you ask our permission for such uses as publication or exhibition in either printed or electronic form or for any use intended to generate income or publicity. We want to know about your high-speed photography projects. We're happy to provide advice and support as needed. Your work could even end up being displayed here.